Based in Egypt, the continuing research of the Khemit School of Ancient Mysticism is focused on the implications of the evidence left behind for us to discover by the indigenous and the ancients of Egypt. Drawing on the expertise of hieroglyphics expert Mohamed Ibrahim and Khemit School Co-Director Yousef Abd’el Hakim Awyan (who has studied ancient Egyptian hieroglyphs his entire life), the Khemit School Team worked tirelessly over recent months, deciphering the mysterious (and hotly disputed) set of around 300 early-Egyptian hieroglyphs carved into remote rock walls in bushland near Gosford NSW, on the east coast of Australia. And the result? Not only are the Gosford ‘Glyphs legitimate, the scribes accurately used several ancient hieroglyphs and ‘grammatical’ variations which, crucially, were not even documented in Egyptian hieroglyphic texts until 2012, immediately disproving all long-standing ‘hoax’ theories. The specific style of hieroglyphs used also provides a linguistic time-frame that places an Egyptian presence in Australia at least 2,500 years ago, while the translated text is even so detailed as to identify the ancient scribes, by name and occupation. Reports of these enigmatic glyphs date back to the early 1900’s, and there has been much controversy about whether they were placed there as a hoax – or that they were in fact, carved by one or more Egyptians in ancient times. My husband, Yousef and Mohamed Ibrahim were so excited by the prospect of our visit, that they began to study the pictures of the Glyphs (that had been sent to us by Sonya at an earlier date) in order to create a video of their findings — so that Beatrice and I would have something to offer as a gift, in return for this generous invitation. It was not long before they were both bustling with enthusiasm over what they were discovering! Not only did they believe that they were authentic… but they could begin to understand the story that the glyphs were telling us. We all knew that a much more thorough and in-depth examination would be necessary- but, we went ahead and filmed a short video of their findings to present to our hosts. After spending many wonderful moments with both old and new friends in New Zealand and Melbourne, as well as being introduced to much evidence that points toward the possibility of a very ancient connection of Egypt with both New Zealand and Australia — we were ready to explore the site at Gosford. We were also honored to be accompanied by Aboriginal Star Lore author and lecturer, Stella Wheildon, who has been entrusted with the gift of the wisdom of the Ngarakwal traditional lore, given to her by Mrs. Marlene Boyd, a direct ‘bloodline to country’ descendant of the Seven Sisters Star Lore – the ancient matrilineal culture of traditions, lore and customs of the Bird Tribes of Australia. Although Steve Strong was unable to join us, we were happy to meet Evan and have him share some of the work that he and his father had been doing for many years. In fact, we were grateful to be introduced to many fascinating people that day, all coming together in the interest of protecting this site — and honoring its historical and multi-level significance. As we were led down the path through the forested area, we soon discovered that there was much more to this site than a few rocks with Egyptian hieroglyphs on them. They are encased in a natural paradise, known to be a sacred area, as a meeting place (in separate locations) for both men and women. 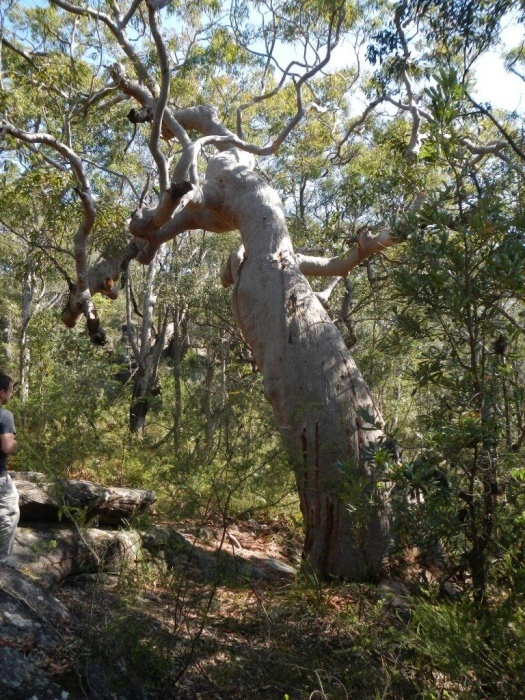 I was especially enchanted by the Grandmother Tree, a huge leaning angophora tree which has stood tall for hundreds of years, just a few steps from the sandstone rocks blanketed with ancient inscriptions. As I came around the corner to view the carved script for the first time, I was surprised at my own reaction. They seemed to be alive, and to speak to me from the distant past. I could almost feel the energy of the writers – and based on what I already knew of story they were telling, began to understand their plight. The sandstone rocks were huge, creating a tall corridor that we were told, once had a roof that covering it. We were guided around the surrounding area and saw many more items of interest, including a shaft that seemed to go deeply inside an area underneath one of the sandstone boulders, as well as more hieroglyphic inscriptions! Beatrice and I were blessed to have experienced many powerful moments that afternoon, as we explored the sacred area before gathering again that evening where we were able to present our film of Yousef and Mohamed’s quick interpretation of the Glyphs. We were elated to witness Auntie Beve’s reaction, who told us that the interpretation Mohamed and Yousef shared, matched the information handed down to her by the ancestors. She spoke to us of how hard she was working to save this and other sacred areas of Australia’s Original people. We made a promise to her that we would return to Egypt, with all the photographs and video taken by Beatrice at the site, to give to Yousef and Mohamed so they could begin a thorough examination, in order to present a much more convincing presentation that we would give to her to help her and others in their efforts to maintain the integrity of the site and its significance to the Original people of Australia. The Khemit School dedicates this video presentation, produced by Sadat and Beatrice Awyan, to Auntie Beve and all of the Original people of Australia. 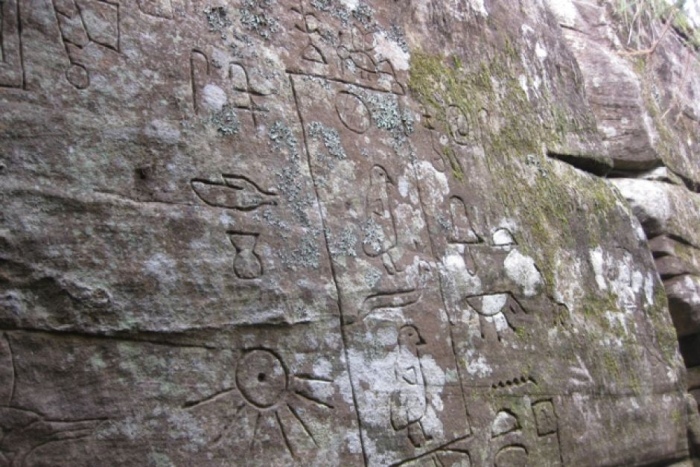 We introduce you to The Gosford Glyphs found in Kariong, New South Wales and we address the question of whether ancient Egyptians had the capability of traveling to Australia. We speak about the authenticity of the Glyphs and how we deciphered them utilizing well known Hieroglyphics texts and other resources. 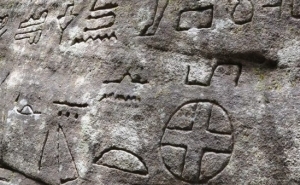 We discuss who wrote these ancient symbols and the message they were delivering on the sandstone blocks, pointing to a possible long term connection between these two ancient civilizations. 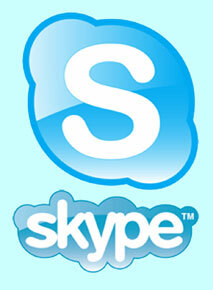 To learn more, visit the Khemit School of Ancient Mysticism at Khemitology.com and YouTube.com/TheKhemitSchool.